In society of instant messaging and microwavable meals, waiting isn’t easy. It isn’t so much the wait in line at the store or at the bus stop for a ride. It is the wait for God’s timing. or the next season of life. Yet, as followers of God, we are called to wait…to follow and not to run ahead. Experience deep spiritual fulfillment requires trust God and His timing. 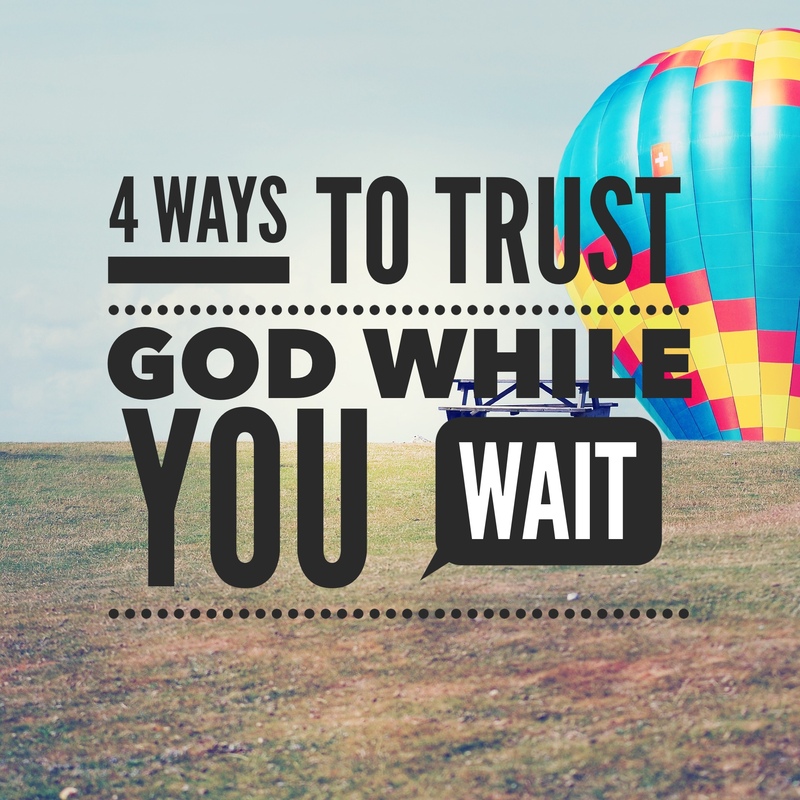 Here are three ways to learn to trust God while you wait. It’s easy to say “trust God.” But if you don’t really understand WHO God is, it’s hard to trust Him. In order to understand and experience the true character of God spend some time getting to know who He really is. -Take some time to make a list of who you already know and (really believe) God to be. Don’t include an attribute or character of God that you aren’t certain of–this is for your benefit not a test you have to pass! -Make a second list of who you need God to be for you RIGHT NOW as your walk through anxiety. -Evaluate and analyze what characteristics of God make Him capable to handle and understand your anxiety. 2. Trust in His dreams for you. Waiting involves a dream or longing in our heart that hasn’t yet come to fruition. Have you asked yourself what God dreams for your life? Have you asked God what He dreams for your life? God has some big dreams for your life. He does. He is unfolding those dreams with every altered plan or slow in progress. We need to let go of our plan and our time-table and realize that God is still very much at work and we are still very much part of His plan. God wants to make changes in our hearts and ready others for what He’s doing. When He gets all the pieces in place and we show up transformed and ready for the fruition of His dream for us, it will make more sense and fall into place. Being a dreamer is fun and honors God but only if we let God be in charge of unfolding the dream. Are you a glass half-full or glass half-empty kinda person? I naturally don’t see the glass as half empty or half full. I more see the glass as needing to be cleaned or improved with a totally different glass! However, I’ve made an intentional choice to daily take time to address areas of gratitude. In my time with the Lord, I write down five things every day that I’m thankful for during that day. I am careful to think creatively and to notice little things in the midst of my chaos that I’m thankful for. It might be as simple as air-conditioning but when you’re moving and its May that’s pretty legitimate! As you seek the adventure of God’s plan for your life, you discover it is in the insignificant and small where God shows up and moves in powerful ways. There is a sweetness as we look back and remember His faithfulness and delight in God’s presence in the small. The reality is that we are all “waiting” on something. The ache of our heart longs for God to fulfill our deepest want. I’d love to hear how you’ve seen God at work as you wait or a story about how God proved Himself faithful through a season of waiting.